The South Area feeder pattern on Friday will host milestone celebrations at Codwell Elementary School and Sterling Aviation High School to showcase improvements and investments in South Area schools. The event will begin with a groundbreaking ceremony at Codwell Elementary, which is receiving a $12.5 million renovation that will allow it to reopen to students. The event will conclude at Sterling Aviation High School, which will celebrate its new 237,000-square-foot facility, which was constructed as part of the voter-approved 2012 Bond Program. This entry was posted in 2012 bond, District IV - Jolanda Jones, Elementary Schools, High Schools, New schools, News and tagged 2012 bond, BuildHISD, Codwell ES, Sterling Aviation High School, Sterling Aviation HS, Sterling High School, Sterling HS on March 1, 2017 by HISD Communications. When Sterling Aviation High School students return to class after winter break, they’ll report to a modern, new building with contemporary furniture, broad windows, and spacious classrooms and hallways adorned in bright, bold colors. The grand building — specifically designed to enhance their aviation sciences program and support 21st century learning — has been long-awaited by the Sterling community, and it is well deserved. This entry was posted in 2012 bond, 21st century schools, Career/technical education (CTE), District IV - Jolanda Jones, High Schools, New schools, News and tagged 2012 bond, Sterling Aviation HS, Sterling HS on December 15, 2016 by HISD Communications. Sterling High School students, staff and community members had the opportunity to sign a steel beam today that will be used in the construction of their new school. The new $72.3 million building project, which is part of HISD’s current bond program, is being built behind the existing facility, which will be demolished once construction is complete. The new three-story building is making great progress and can now easily be seen over the top of the current school. After the beam-signing, which was held in front of the current school, workers transported it to the construction site, where they will soon install it in the new building. This entry was posted in 2012 bond, District IV - Jolanda Jones and tagged 2012 bond, Sterling Aviation HS, Sterling HS on September 18, 2015 by HISD Communications. A large crane arrived at the Sterling High School construction site this week, and on Wednesday it lifted and placed the first three-story, concrete tilt wall panel. Members of the Project Advisory Team and a handful of Sterling students were on site to celebrate the milestone and add their signatures to the wall before it was lifted. This entry was posted in 2012 bond, 21st century schools, District IV - Jolanda Jones and tagged 2012 bond, Sterling Aviation HS, Sterling HS, Trustee Paula Harris on May 22, 2015 by HISD Communications. 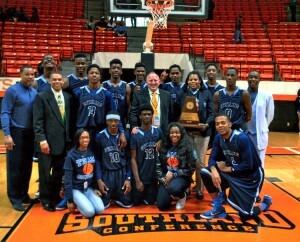 This entry was posted in Athletics, District IV - Jolanda Jones, News and tagged basketball tournament, State Basketball Championship, Sterling Aviation HS on March 10, 2015 by HISD Communications.